Mokhtar Belmokhtar - a one-eyed war veteran nicknamed "Mr Marlboro" and described as "uncatchable" - achieved international notoriety for ordering a deadly attack on an internationally run Algerian gas plant in January. Four months later, he was reported to have masterminded two suicide attacks in Niger, targeting a military base in Agadez and the French-run uranium mine in Arlit, killing at least 25 people. He has been declared dead many times, the latest by a US air strike on 14 June in Libya, according to the country's authorities. However, Belmokhtar has survived previous announcements of his death. In March 2013, the Chadian army claimed to have killed him, only for him to resurface months later. For years, the US government has been offering a reward of up to $5m (£3.3m) for information leading to his location. "He is one of the best known warlords of the Sahara," Stephen Ellis, an academic at the African Studies Centre in Leiden in The Netherlands, says. He became known as "Mr Marlboro" because of his role in cigarette-smuggling across the Sahel region to finance his jihad, which he has recently waged under the banner of the Signed-in-Blood Battalion. "Belmokhtar has been active in political, ideological and criminal circles in the Sahara for the past two decades," Jon Marks, an academic at the London-based think-tank Chatham House, told the BBC. Born in Ghardaia in eastern Algeria in 1972, Belmokhtar - according to interviews posted on Islamist websites - was attracted as a schoolboy to waging jihad. Inspired to avenge the 1989 killing of Palestinian Islamist ideologue Abdullah Yusuf Azzam, he travelled to Afghanistan as a 19 year old to receive training from al-Qaeda. "While there, Belmokhtar claims [on Islamist websites] to have made connections with jihadis from around the world," says the US-based Jamestown Foundation, in a report published on its website. "Moreover, Belmokhtar claims to have been to battlefronts 'from Qardiz to Jalalabad to Kabul'." When he returned to Algeria in 1993, the country was already in the throes of conflict after the French-backed Algerian military annulled elections that the Islamic Salvation Front (FIS) was poised to win. Belmokhtar joined the conflict, which claimed hundreds of thousands of lives, and became a key figure in the militant Armed Islamist Group (GIA) and later the breakaway Salafist Group for Preaching and Combat (GSPC). Algerian journalist Mohamed Arezki Himeur says Belmokhtar lost his left eye in fighting with government troops in the 1990s and now wears a false eye. "He has been condemned to death [by Algeria's courts] several times," he adds. When the GSPC merged with al-Qaeda in the Islamic Maghreb (AQIM), Belmokhtar headed an AQIM battalion in the desert between Algeria and Mali. After AQIM stripped him of his title as "emir of the Sahel" as a result of in-fighting, Belmokhtar launched a new jihadist group in 2012, known variously as the Signed-in-Blood Battalion, the Masked Men Brigade and the Khaled Abu al-Abbas Brigade. The bloody attack on the In Amenas gas facility in south-eastern Algeria was its first big operation, showing that he remained influential despite his marginalisation within AQIM. Among the hundreds of hostages seized were many Western workers. By the time Algerian forces had brought the crisis to an end, 38 people were dead, of whom all but one were foreigners. It was thought Belmokhtar's aim had been to move the Western hostages to northern Mali, where French troops had intervened to oust an alliance of Islamist militants. Sightings of Belmokhtar had been reported in the two main cities in northern Mali, Timbuktu and Gao, since the al-Qaeda-linked rebels seized control of the region in 2011. "He knows the Sahara Desert very well," says Mr Himeur. In recent years, Belmokhtar has gained notoriety as a hostage-taker across the vast Sahara, often demanding multi-million dollar ransoms from Western governments which - along with cigarette-smuggling - finances his jihad. Former UN Niger envoy Robert Fowler was captured by Belmokhtar loyalists outside Niger's capital, Niamey, in December 2008. "We were frog-marched and thrown into the back of a truck... We began our descent into hell - a 1,000km [600-mile] journey northwards, into the Sahara Desert," he told the BBC. "I think I know instinctively what they [the hostages captured in Algeria were] going through." In its report, the Jamestown Foundation said Belmokhtar had been able to operate across borders because of his deep ties to the region. "Key to Belmokhtar's Saharan activities has been his strong connections with local Tuareg communities... Belmokhtar is reported to have married four wives from local Arab and Tuareg communities," it said. 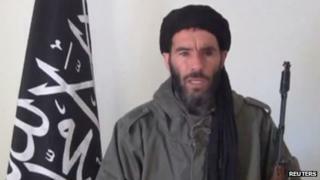 In June 2012, Algerian media reported that Belmokhtar - described in 2002 by French intelligence sources as "uncatchable" - had been killed in clashes between Islamists and Tuareg separatists in northern Mali. But this turned out to be untrue. The Signed-in-Blood Battalion warned in December 2012 against any attempt to drive out the Islamists from Mali. "We will respond forcefully [to all attackers]; we promise we will follow you to your homes and you will feel pain and we will attack your interests," the group said, according to Sahara Media. The attacks in Niger, while planned by Belmokhtar, were allegedly carried out by his allies in Mujao fighters - angered by Niger's co-operation with France and involvement in Mali. Niger's President Mahamadou Issoufou believes the militants who carried out the attack came from new bases in southern Libya. His country has contributed soldiers to the 6,000-strong West African force in Mali, which deployed following the French intervention in January 2012 and which will be incorporated into the new UN force in July. After the Niger attacks, an statement allegedly posted online by the Signed-in-Blood Battalion and signed by Belmokhtar urged Niger's withdrawal with this warning: "Columns of commandos and those seeking martyrdom are ready and waiting for their targets." Final assault: The Algerians ended the raid on 19 January, killing the last 11 captors after they had killed seven hostages, state media reported. The Algerians said 37 foreign hostages and one Algerian worker died. Among the dead were a reported 32 militants.